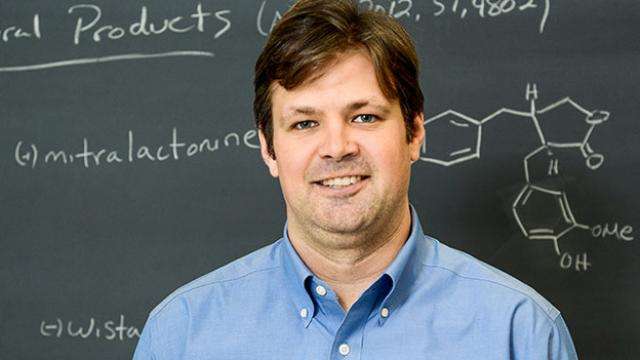 A team of chemists led by Northwestern University's William Dichtel has cooked up something big: The scientists created an entirely new type of nanomaterial and watched it form in real time—a chemistry first. "Our work sets the stage for researchers interested in studying the fundamental properties of interesting materials and applied systems, such as solar cells, batteries, sensors, paints and drug delivery systems," said Dichtel, the Robert L. Letsinger Professor of Chemistry at the Weinberg College of Arts and Sciences. "The findings have enormous implications for how chemists and materials scientists think about nanotechnology and their science in general." The researchers made covalent organic frameworks (COFs) that are stable—a major advancement. These strong, stiff polymers with an abundance of tiny pores are suitable for storing all kinds of things, including energy, drugs and other cargo. But what limits COFs from realizing these applications is that they are usually prepared as powdery substances that can't be processed into useful forms. In this study, the nanoparticles stay suspended in a liquid "ink," creating a new nanomaterial called a COF colloid. This structure allows the unique materials to be processed into useful forms, such as films of arbitrary size and thickness. Also, for the first time, the chemists demonstrated that the "cooking," or heating up, of the ingredients for the nanomaterial can take place inside the imaging tool itself, in this case a powerful microscope called a transmission electron microscope. With this new technique, Dichtel and his team could investigate how molecules come together to form COF colloids. The study, titled "Colloidal Covalent Organic Frameworks," was published last week in the journal ACS Central Science. Dichtel is a corresponding author of the study. "This is about as close to useful 'molecular LEGOs' as I've seen," Dichtel said. "Being able to keep these materials stable in solution is a major step forward towards taking advantage of their unique combination of properties." "This is something that is routine on the macroscale, of course, but has eluded chemists, biologists and physicists at the nanoscale," Gianneschi said.